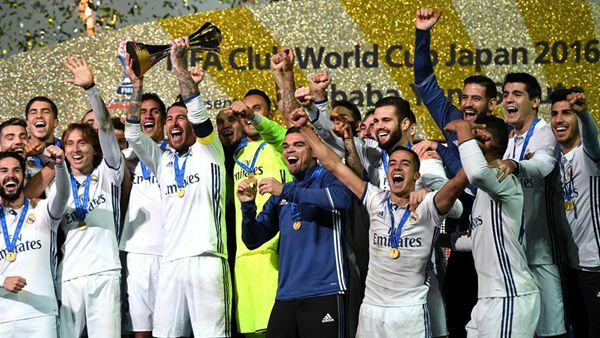 Cristiano Ronaldo rose to Real Madrid's rescue with a hat-trick to fire them past Kashima Antlers 4-2 after extra time in the final to clinch the 2016 Club World Cup title on Saturday. History making J.League champions Kashima Antlers lost to Real Madrid 4-2 after extra time in the final of the FIFA Club World Cup Japan 2016 after both sides had been level at 2-2 in regulation time at the International Stadium Yokohama on Sunday. Los Blancos, who tasted victory at Morocco 2014, were made to work hard for their world title by spirited Kashima. After Karim Benzema opened the scoring on nine minutes, a Gaku Shibasaki double fired the Asian side into a dramatic second-half lead. But the UEFA Champions League winners kept their composure and after Ronaldo restored parity with a penalty on the hour mark, the Portugal superstar inspired his side to victory with two extra-time goals. Despite Los Blancos' dominance, Kashima continued to pass the ball elegantly and with their first clear-cut chance, they grabbed an equaliser before the break. A Doi cross found Shibasaki in the centre of the area, who showed great composure to control the ball, beat his marker and fire past Navas to send the host fans into the raptures. The J.League champions lead was short-lived, however, when Ronaldo converted a penalty on the hour-mark after Shuto Yamamoto brought down Lucas Vazquez inside the area. Ronaldo went close almost immediately after the re-start after winning the ball from Naomichi Ueda and charging towards goal; his effort saved by Sogahata. As extra-time followed, Ronaldo fired Real into the lead on 96 minutes after receiving a well-worked through-ball from Benzema and completed his hat-trick soon after, latching onto Toni Kroos' pass to convert from close range. Cristiano Ronaldo rose to Real Madrid's rescue with a hat-trick to fire them past Kashima Antlers 4-2 after extra time in the final to clinch the 2016 Club World Cup title on Sunday.